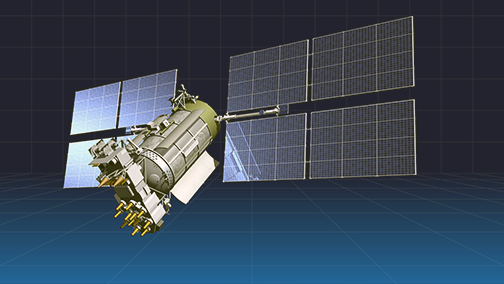 Artistic rendition of a Russian Glonass-M satellite. Image is courtesy of ISS Reshetnev. Russia has successfully launched a Soyuz-2.1b carrier rocket from the Plesetsk space center to orbit a Glonass-M satellite, this according to the Russian Defense Ministry and the Sputnik news infosite. "On Sunday, at 00:46 Moscow time [21:46 GMT]… the Space Forces of the Aerospace Forces successfully launched a middle-class Soyuz-2.1b carrier rocket with a navigation Glonass-M spacecraft," the ministry said in a statement. Hours later, the ministry reported that the satellite reached the designated orbit. "The middle-class Soyuz-2.1b carrier rocket launched on June 17 at 00:46 [21:46 GMT on Saturday] from the Plesetsk space center (Arkhangelsk Region) successfully put the Russian navigation Glonass-M spacecraft to the designated orbit," the ministry's press service said. Earlier, a satellite producer— Reshetnev Information Satellite Systems — reported that the signal interface control document for GLONASS would be updated in 2018, making radio signals to the satellite navigation system less susceptible to corruption. During the soviet era, the GLONASS navigation system was intended to become operational in 1995, the same year that the U.S. launched its GPS; however, due to lack of funding ,the system was put on hold. In the early 2000s the system was launched and, by 2011, the full constellation of satellites was re-established.